We are home again after our few days in Ludlow. 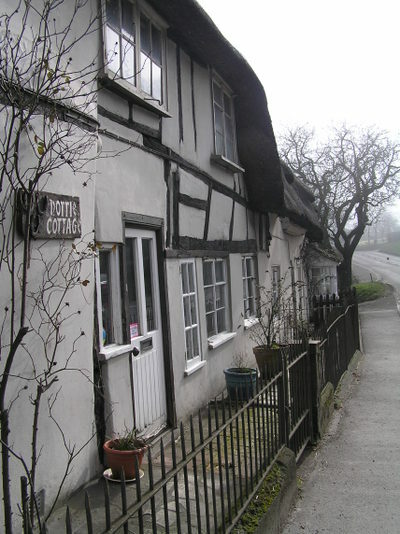 Anth and I dropped the children with my mother and step-father in Dorset and then made our way through the Cotswolds (I think probably one the most beautiful parts of England - well it's where I would choose to have my cottage anyway!) to Ludlow, which is where my father lives. The journey took us through a small number of villages but certainly not as many as I had thought. I expect we would have had to go off the main roads to find what I had wanted, but the weather was cold and misty and we had the cat with us so I felt we really had to get to our destination as quickly as possible - I will save exploring for another time. I did take some photos...the cottages above and we found a little church with it's graveyard covered with Snowdrops. 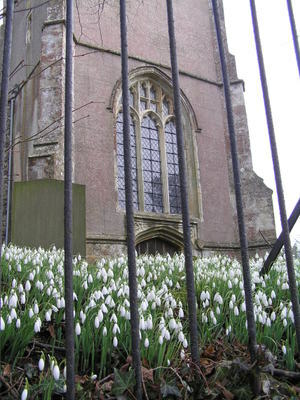 It's not the prettiest of churches but the Snowdrops had caught my eye. There was me raving on about my 1st and only Snowdrop in my garden afew days earlier - it seems that the whole country has had them for weeks! I stood on the path and had a eye level view and thought that they looked like a small army! The weather, as I have said before, was not good for photography during the time we were away. Very cold, which I like - excuse to have the fire burning - but it was so dark and I am disappointed in the quality of the pictures. I hate to use the flash so you will have to bear with me if the pictures seem poor quality. It was lovely to see my father again. My aunt and uncle also live close to him so we were able to see them both too whilst we were there. Ludlow is a beautiful town. It has it's own ruined Castle and fortified royal palace, dating from 1086. 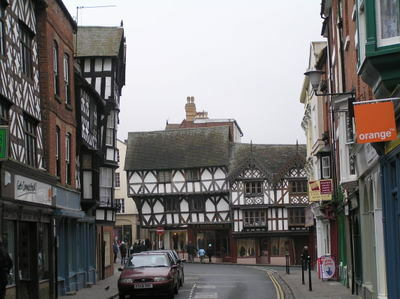 My father is an active member of the choir of St Laurence which is the parish church of Ludlow and right in the heart of the town. 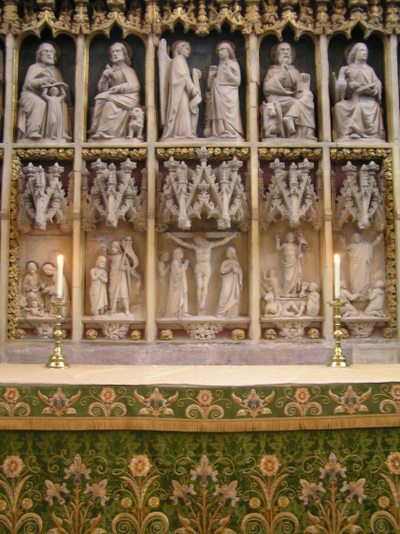 The high altar in the Chancel. I'm sorry that it is a bit fuzzy..my photos really don't do the church justice. 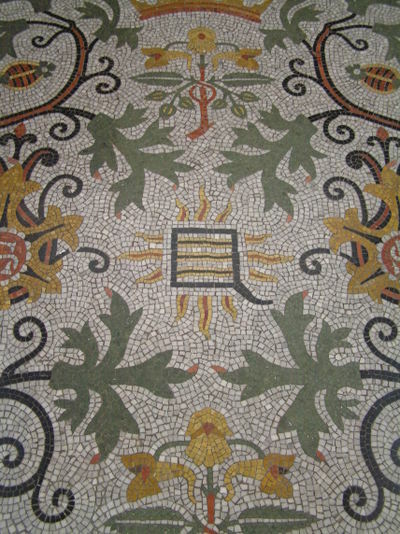 I really loved the floor by the altar. This is only a small part of the floor! 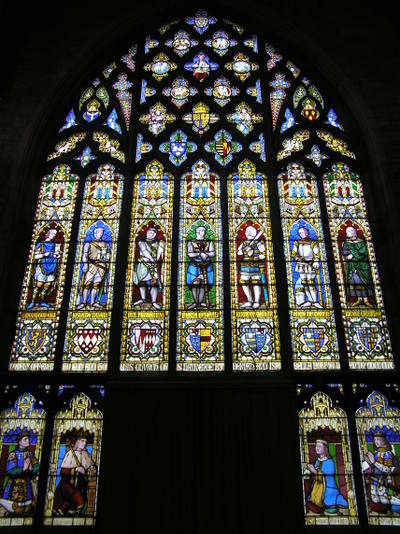 The early glass is quite beautiful and again my pictures do not show the full beauty. I will post some more pictures tomorrow and also show you what treasures I have found and some pictures of inside my favourite shop 'Utter Clutter'....the name says it all!